Industra-Coat is the epoxy and urethane system of choice when strength matters. It is commonly used in auto service centers, warehouses, aircraft hangers, garages, basements, and more. Available in clear or 12 great colors. Preparation: Substrate should be very clean, dry with little to no hydrostatic pressure, neutral to slightly alkaline, and have a surface profile equivalent to a 200-300 grit sand/grind. Recommended application temperature is 70 degrees F (see cure schedule for details). Mix Industra-Coat 3015 Part A and Industra-Coat 3015 Part B at a mix ratio of 4 Parts A to 1 Part B. Stir thoroughly with a drill mixer at low speed to avoid air entrapment. Pot life is approximately 45 - 60 minutes under normal temperature and humidity conditions. Roll on Industra-Coat 3015 with a 1/4” or 3/8” nap roller. Adhesive and epoxy roller covers are recommended for best results. Coating should be applied at 5-7 mils wet thickness (1 mil = 1/1000th of an inch). Coverage rate at 6 mils wet thickness is 267 ft.2 per gallon. Mix Industra-Coat Urethane Part A and Industra-Coat Urethane Part B at a mix ratio of 2 Parts A to 1 Part B. Stir thoroughly with a drill mixer at low speed to avoid air entrapment. Pot life is 2-4 hours under normal conditions. Roll on Industra-Coat Urethane with a 1/4” or 3/8” nap roller. Adhesive and epoxy roller covers are recommended for best results. Coating should be applied at 3-5 mils wet thickness (1 mil = 1/1000th of an inch). Coverage rate is 320-500 ft.2 per gallon at 3-5 mils wet thickness. 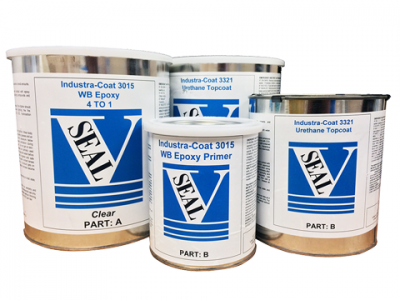 Our Industra-Coat Epoxy and Urethane Kits include our Industra-Coat 3015 Epoxy Primer, and one of our Industra=Coat two-part urethane topcoats. Our Gloss kits include our Industra-Coat 3321 or 3322 Solvent Based Urethanes. Our Satin Kits include our Industra=Coat 3520 Water Based Urethane. Our 500 ft.2 kits include a 2 Gallon Kit of Industra-Coat 3015 Epoxy and a 1.5 Gallon Kit of Industra-Coat Urethane. Our 1200 ft.2 kits include a 5 Gallon Kit of Industra-Coat 3015 Epoxy and a 3 Gallon Kit of Industra-Coat Urethane. Are Industra-Coat Kits offered in clear or colors? 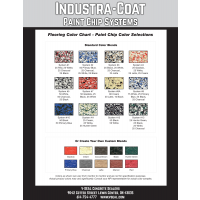 Industra-Coat Kits are offered in clear and opaque colors. When chips are in the plan, an opaque primer coat is used with a clear topcoat. When can I apply my Industra-Coat Kit? Your concrete should be fully cured (typically at least 28 days old), without moisture issues, and properly prepared. Recommended application temperature is 70 degrees F with little fluctuation throughout the curing period (3-5 days) if possible. We recommend that the surface is clean, dry with little to no hydrostatic pressure, neutral to slightly alkaline, and has adequate mechanical bond. Mechanical bond (texture) should be equivalent to a 200-300 grit sand or grind. 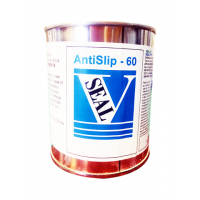 This allows the coatings to grab on to the concrete and helps prevent delamination in the future. How can I test my concrete for moisture issues? Simple tape test = tape a square of plastic to your concrete for a few days, if a dark moisture spot appears, there is likely hydrostatic pressure. Hydrostatic pressure means that water is being forced up through the pores of your concrete. Too much hydrostatic pressure can be bad for epoxy and urethane coatings. Calcium Chloride Test - Similar to the tape test, but with measurable results. This test includes a tray of calcium chloride that is under the plastic square. The tray is weighed after performing the test to determine how many pounds of moisture are being released per thousand square feet every 24 hours (lbs/ft.2/24 hours). Measurements above 5 lbs should be addressed before applying epoxy or urethane coatings. If necessary, we recommend applying V-SEAL 101 then remeasuring. How long do I have to apply my coatings after mixing? Carefully consult your product labels and cure schedules before beginning your project. Pot life is the workable product time before the product becomes difficult to apply and starts tacking back up on the roller or solidifying. *Pot-life and cure schedules are estimated at recommended application temperature of 70 degrees F. Warmer temperatures will decrease pot life and accelerate cure schedule. Colder temperatures will increase pot life and decelerate cure schedule. Products should also be at room temperature (70 degrees) before mixing to ensure accurate cure times. What are the temperature and weather constraints for application? Two-part epoxies and two-part urethanes are much more sensitive to temperature than reactive penetrating sealers or single component coatings. Ambient and substrate temperatures should be controlled around 70 degrees F during the application and curing period (3-5 days). Relative humidity should be less than 50%. Can I apply chips? Do you sell them? Absolutely. We offer paint chips and premixed paint chip systems. They are typically broadcast while the epoxy is still wet for adhesion, then topcoated with urethane to seal them in place. They also naturally provide light anti-skid properties. Will the surface be slippery? What can I do about it? Nearly all coatings for concrete and masonry will reduce the coefficient of friction once applied - making the surface more slippery when wet or dusty. Anti-skid may be used to counteract this, and can be used to achieve any level of traction (even as rough as sandpaper) with proper testing. We offer anti-skid for all of our topical coatings. When should I re-apply more epoxy or urethane? Depending on traffic, epoxy and urethane coatings can last 5-15+ years before reapplication is necessary, especially if properly cared for. What are the shelf-life and storage recommendations for Industra-Coat Kits? Industra-Coat Kits have a one year shelf life when unopened and properly stored without freezing. After opening, shelf life is diminished and kits should be used within one month. A dry gas blanket may extend shelf life after opening. How do I dispose of leftover Industra-Coat Epoxy and Urethane?